Again, I apologize for my lack of posting the past few weeks! Things are just super crazy right now. So excited for all the books I got this week. I finally have a finished copy of The Goddess Test and Goddess Interrupted. I love that series! The Vampire Empires series is not YA, but it sounds great, and has gotten some really good reads. I really enjoyed The Goddess Test and have yet to get a copy of Goddess Interrupted. I hope it's just as good or even better! I loved The Goddess Test and I really need to read Goddess Interrupted. Great mailbox post. 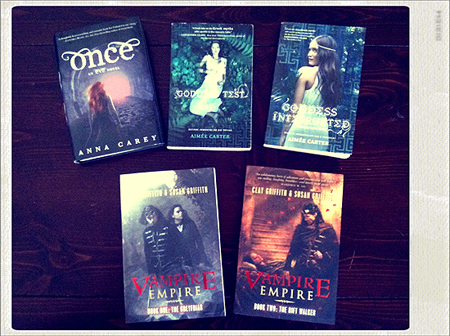 I haven't heard about the Vampire Empire books but I like the look of them! Looking forward to reading Once and I've heard a lot of good things about The Goddess Test! Happy reading :). OOh nice! Seen the Vampire Empire books myself, but haven't had the time to look into them! Happy Reading! The Goddess Test covers are so pretty! Exciting that you have copies. I am going to get Once out of the library and see if I like it more than I liked Eve. Man, I need to get around to Goddess Interrupted. I surprisingly enjoyed the Goddess Test after hearing some really bad things about it. I've actually got Eve sitting on my shelf, which I also have to get around to :$ haha. I love the cover of once but i have yet to read eve :( Great haul! The Vampire Empire novels looks wonderful. YAY! for buying finished copies of books we/you've liked. :) I always love putting physical copies on my shelf after having loved the eARCs. Also thank you for reminding me that I really need to read my copy of EVE soon. :D Happy reading, my dear! I really want to read The Goddess Test, and Vampire Empire series looks really good! Great mailbox- I have been dying to read the Goddess Test series and need to get my hands on a copy this summer. Enjoy all of your books! Aimee Carter's novels are so addictive! If I ever have money to splurge, I definitely want physical copies of her books, since I only have them on my Nook. Happy reading, Christy! I enjoyed The Goddess Test but I had issues with Goddess Interrupted; I haven't read Eve or Once but I hope you enjoy all of your books! Old email follower (chidoryx at hotmail). Hmm. I've read the first 3, but not the last 2. I look forward to seeing what you think! Enjoy all of your new reads!! !